Looking to Finance Your Next Remodel Project? A remodeling project doesn’t have to be paid for all at once, but some options are better than others. We can help you save money on interest and get approved quickly and easily! Speak to a Designer Today! Yes, cash is the best way to go. But it’s not the only way, or the most convenient. Get the home of your dreams without breaking the bank! Meet with a professional designer in our store and fill out a simple application for your financing! It’s that easy. The application takes minutes, and approval takes only minutes more! You’ll be ready to shop in no time at all! With either of our financing options, you’ll get 6 months same as cash, 0% Interest! You’ll wonder why you never considered it before! Credit cards aren’t the only option. You could pay 18% interest or more by using a credit card. But not with our financing! To qualify for Cambria Financing, simply purchase 4 square feet or more of their gorgeous quartz and you can qualify for up to $65,000 for your ENTIRE remodel! 6 months 0% interest. To qualify for Synchrony Financial Financing, just fill out the easy application in store and be approved in minutes! Use your newly approved credit line for anything in our store including installation! 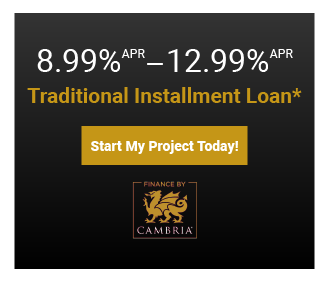 6 months 0% interest!